There once was a business owner who always had someone else do her business website because she was just too busy running her business. She trusted the people who took care of her website because up to now, there was never a problem. One day, she decided to enhance her website. She found a website designer who agreed to exchange services. Next thing you know, words like “transfer” and “EPP code” are being thrown around. What happens next ? Her old website vanishes, and a new, incomplete, content lacking website template originates in it’s place. In addition, she discovers that her domain has also been moved and she no longer has access to it either. Six years in business, with a 6 year old website full of content to reflect those years, gone instantly. This is a true story that is still in the process of being sorted out. The business owner must wait 30 days after the transfer before she can transfer the site back. If the hosting provider decides to be difficult by refusing to give the EPP code and open the domain for transfer, legal action may surely follow. When someone asks you for your EPP code, this means that a transfer is being initiated. 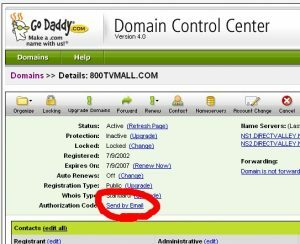 This means that your domain will no longer be hosted by your current provider, like Go Daddy. It is now moving somewhere else, and hopefully you are fully aware of this, and are provided with login information to the new hosting company. If you are sure that you want to transfer your domain, check to see how much the new provider will be charging you for the yearly service, and also ask if there is a transfer fee involved. (usually not). There is generally no need at all to move a domain because you can point the name serve to wherever your site is being hosted. The moral of the story is this. If someone asks you for your EPP code, make sure you understand what that means before you give this information. You may even consider something in writing. You may be fortunate enough to have a fabulous hosting provider, such as Women In Business or generationSEO, in which case you are safe, but if you don’t know the person well enough, please be cautious. Speak to other people who have worked with that individual and ask a lot of questions. Due diligence is always important before any decision that will impact your business. Your website is your business and your livelihood. Keep a tight grip on it.